I had a special treat this weekend. I got to take off for the afternoon, drive myself to a library far, far away and meet a fabric master. 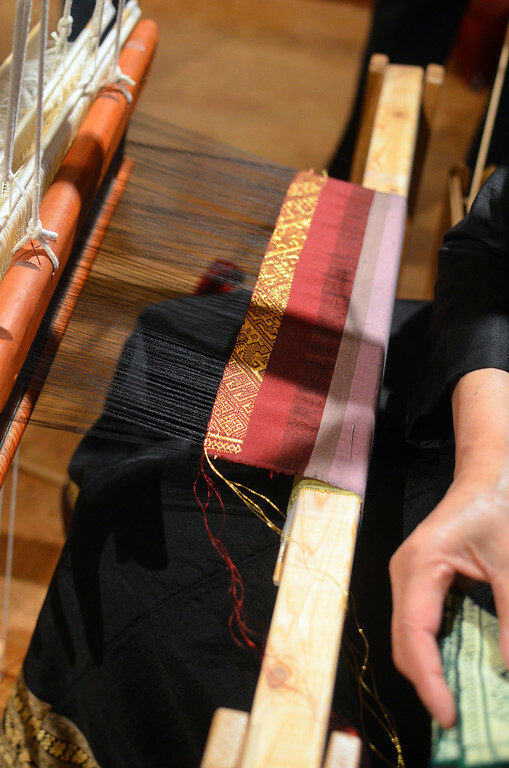 A master who weaves, among other things, ikat. The husband found the little blurb in the newspaper, and told me about it. Whoo. 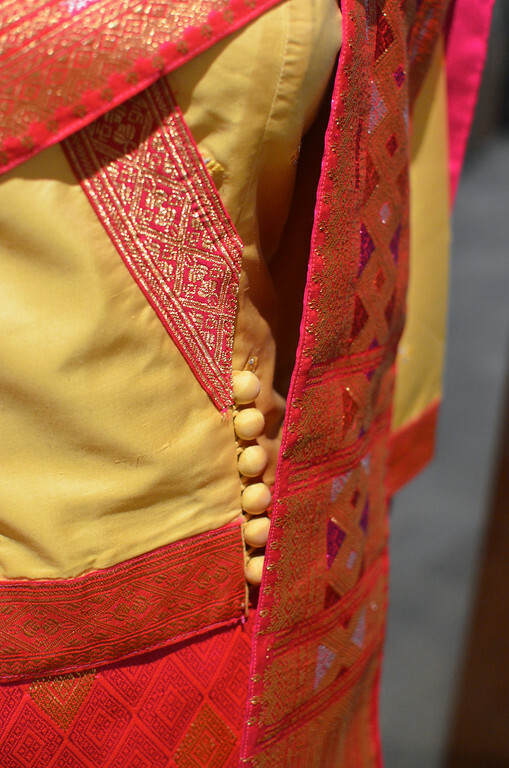 How often do I get to see fabric from other cultures made before my eyes? And ikat, no less? But the exhibition was about so much more than fabric. and this is the resilient, inspiring and incredibly talented Bounxou Chanthraphone Daoheuang , recipient of multiple prestigious awards, including the Bush Foundation Enduring Vision Award. I'm kicking myself for not having got a better photo of this remarkable lady. 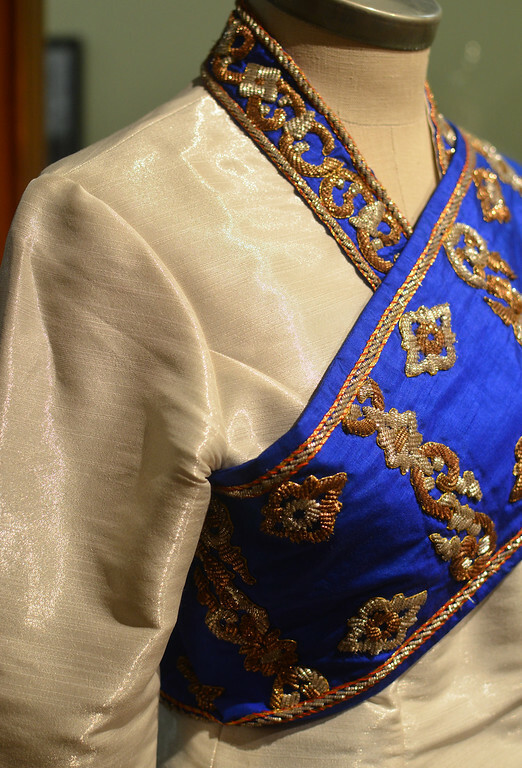 To say she weaves amazing fabric is a serious understatement. 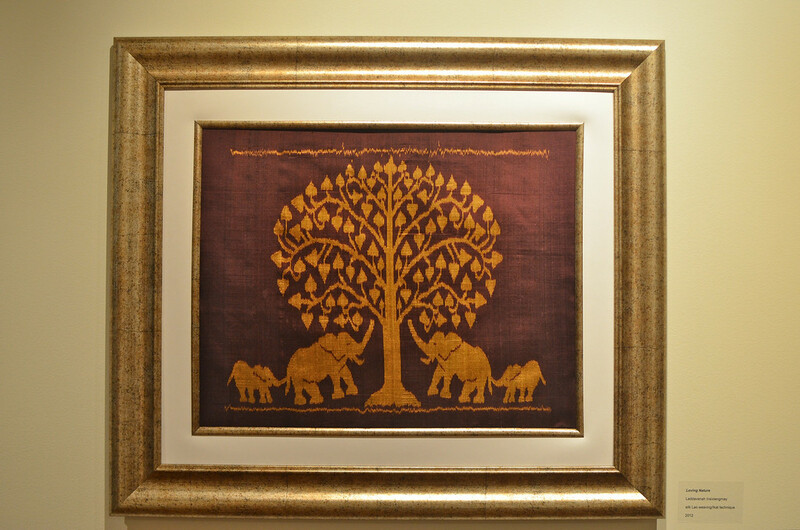 Because those fabrics also have stories to tell. 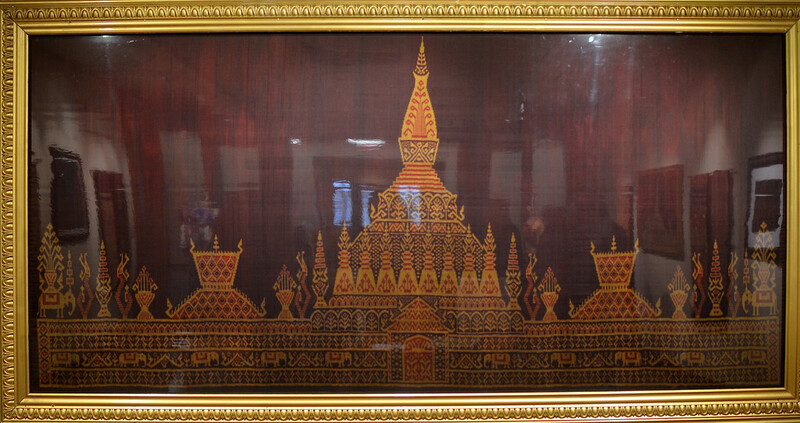 Like her 6-feet-long ikat rendering of Lao's Pha That Luang. If you could only have been there to take in the scope of this masterpiece. 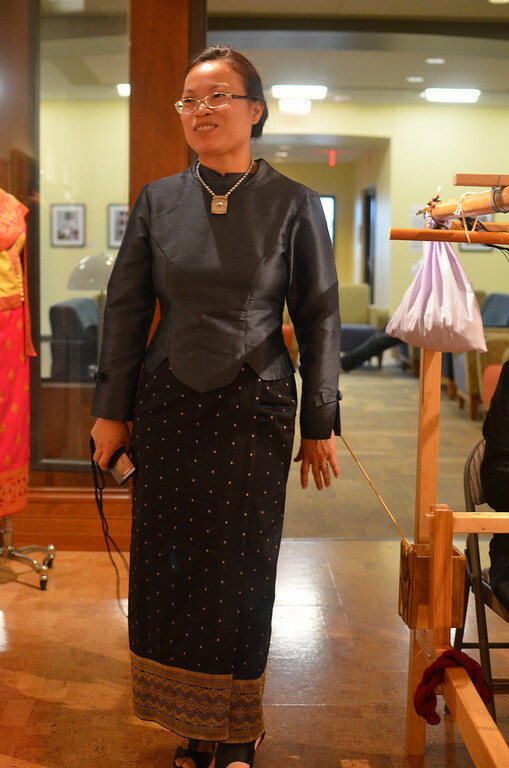 She has lived in the US for many years since leaving Laos. But while she was still living there, she farmed silkworms, and harvested the silk with which to weave. So yes, she really does make her own fabric. From scratch. 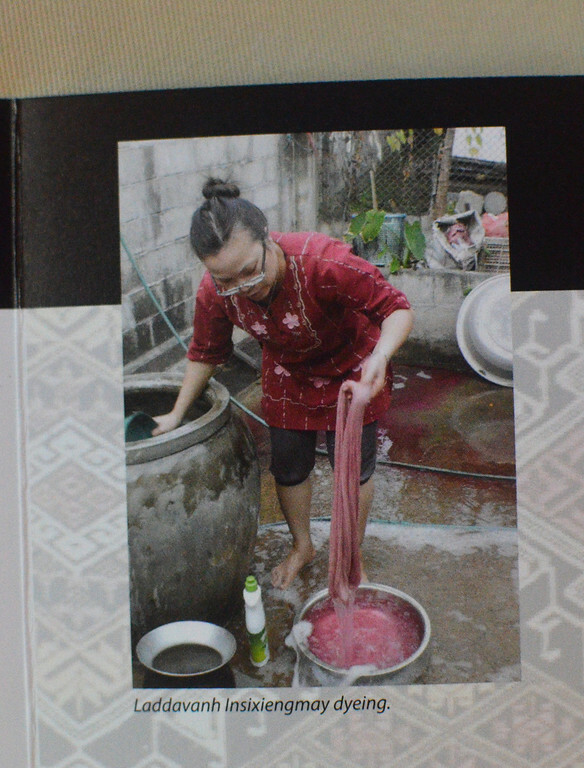 With natural and chemical dyes, and in patterns right out of her own head. 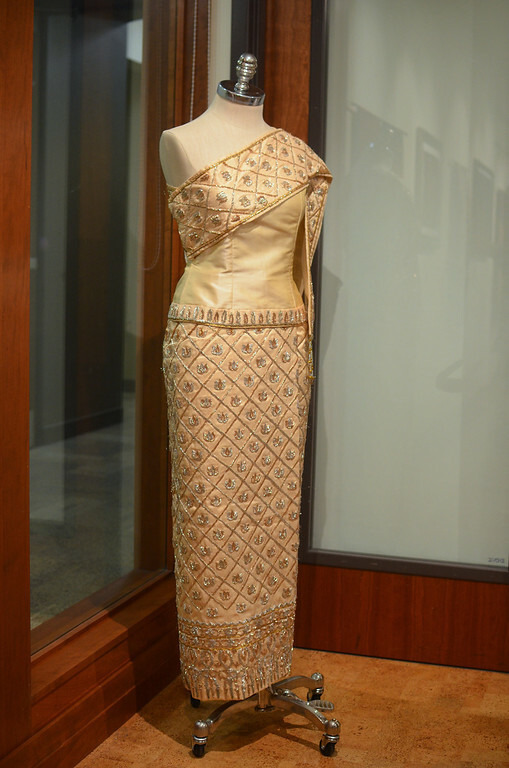 And then sews them into astounding outfits, like these wedding dresses. I also met Bounxou's lovely daughter Laddavanh Insixiengmay, herself an accomplished artist. I loved visiting with Ladda. We talked about drafting (we do it the same way, and neither of us understands commercial patterns much), and her life and work. And her mother, of course. It was simply delightful to hear them tell about their lives and their art. How it takes Bounxou two days to weave enough solid silk fabric to make a blouse, and how it's hard to cut into that fabric because she wove it herself. 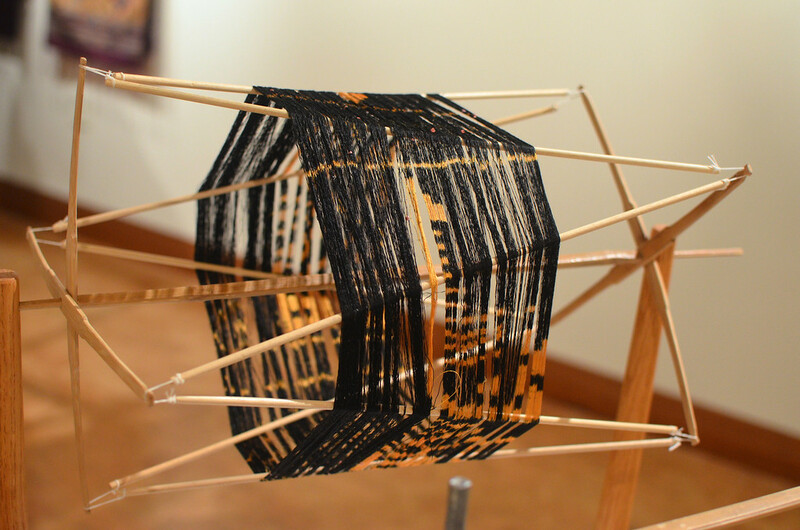 How, sometimes, she weaves just a tiny, specially-shaped piece from leftover threads for a sleeve, or a cuff. 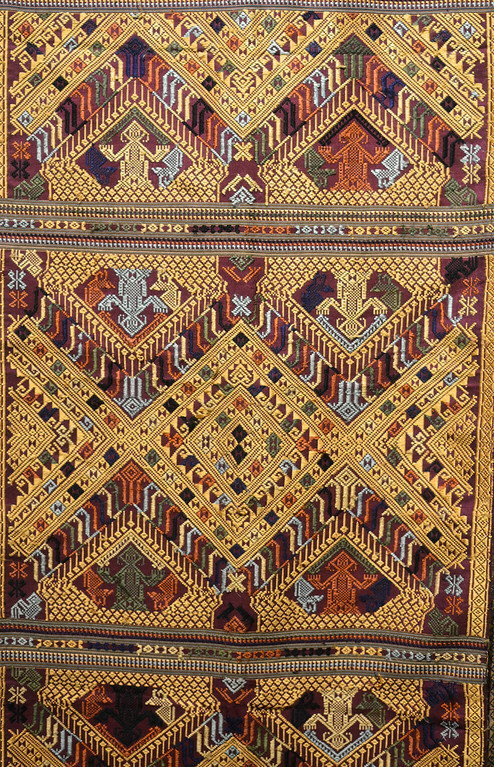 That it took tens of thousands of threads to weave that magnificent ikat rendering of the Pha That Luang. How it is difficult to put a price on her work because there is so much of themselves, their history, their culture in it. 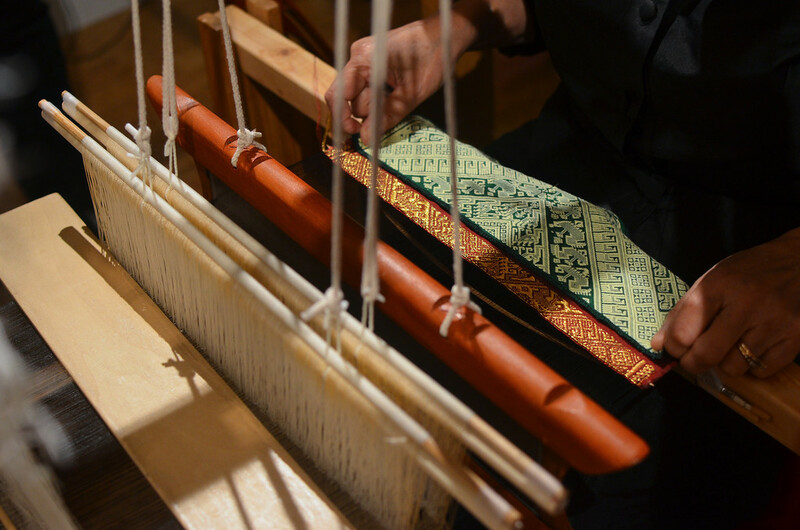 How she "feels good when she touches the silk", and how weaving has helped her focus on the good things and forget the bad things in her past. How generous and passionate she is about sharing her knowledge and skill with as many people as she can, from non-profit organizations to schools and everyone who will invite her. 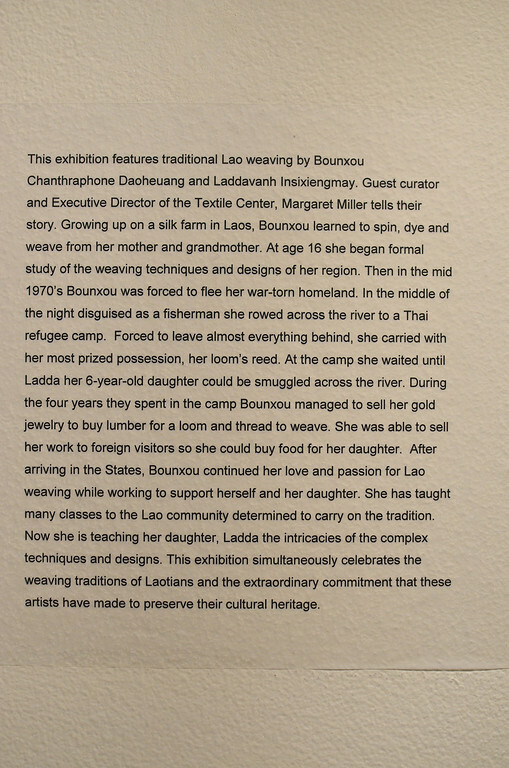 How Bounxou is not only her mother, but Ladda's teacher and inspiration. Bounxou is handing down her legacy and skill to Ladda, and I was at least a teeny bit jealous that they are in the same country, weaving on the same looms, just inches away from each other, without having to resort to (like Mum and I do) a jerky skype video conference to consult on fit or pattern drafting. But I digress. Let me show you more photos. 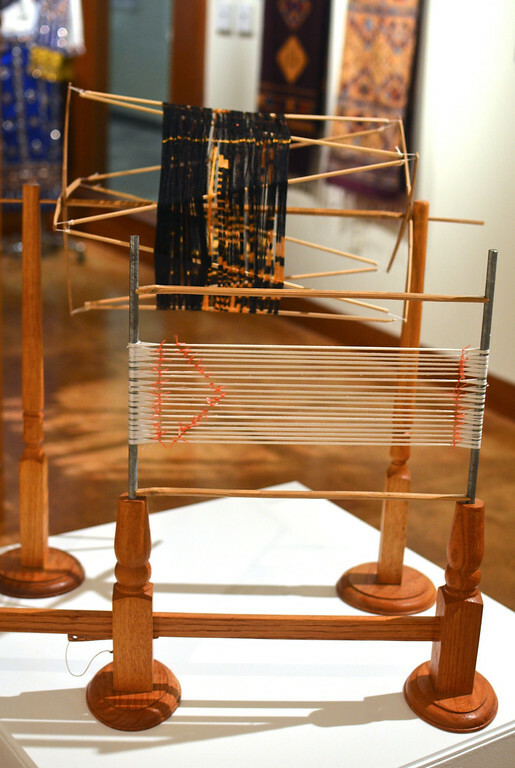 These are the ikat frame and the ikat wheel. Do you see these threads? They are tie-dyed. Each thread. 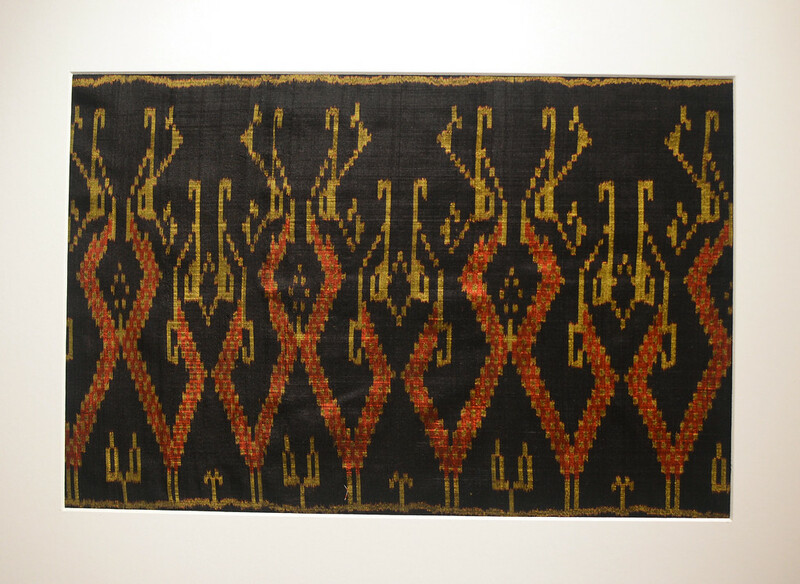 Tied in bunches and dyed in increasingly-darkening colors, the threads are then woven into ikat fabric. This is how ikat gets its name. 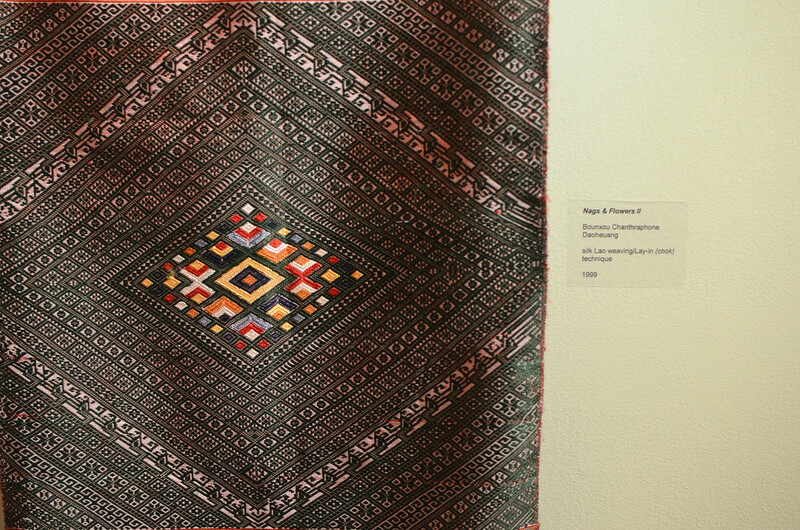 Ikat means "tie" or "bind", and unlike the ubiquitous tie-dye Tshirts that use a similar technique to color different designs on whole fabric, the sequence is quite different. And far, far more time consuming and artistic. I brought my camera with its ikat strap - so coarse and unrefined compared to the work Bounxou does. But she touched it and said, "Ah yes, ikat!" Which made me deliriously happy. 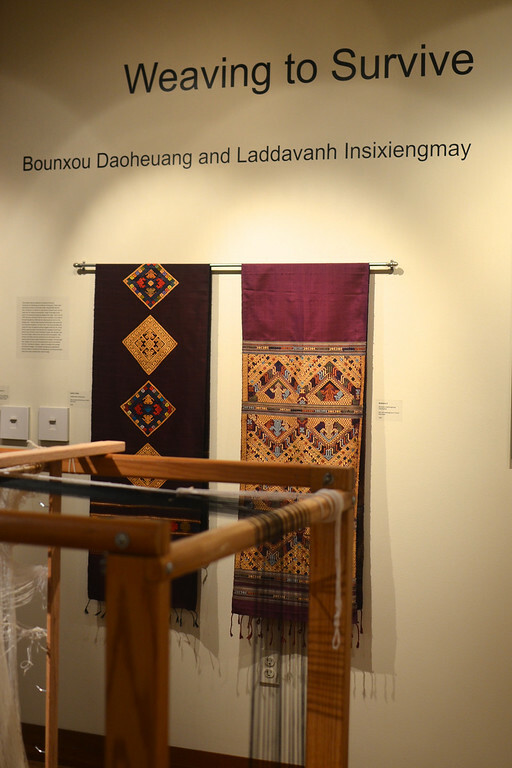 At the exhibition, Bounxou demonstrated the weaving of brocade. 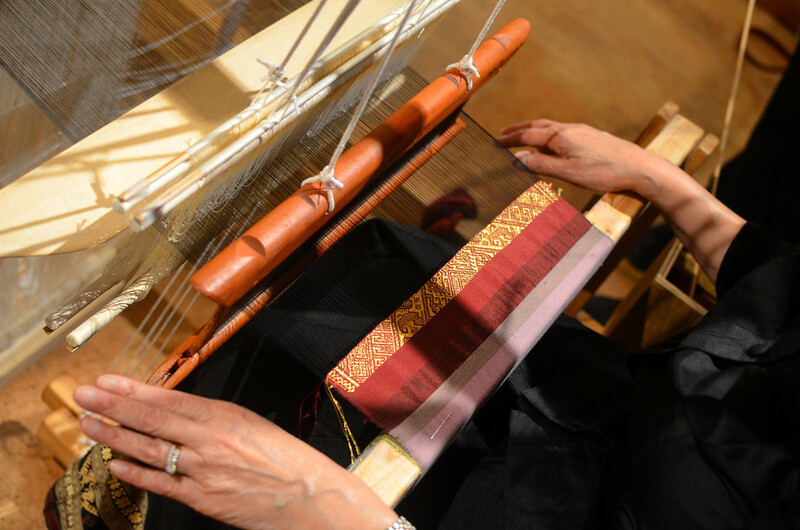 The green piece of fabric is a completed work that she was replicating on the loom in red and gold silk. These white threads are, as I understand it, a sort of template for the design that will be reproduced on the actual red and gold fabric. 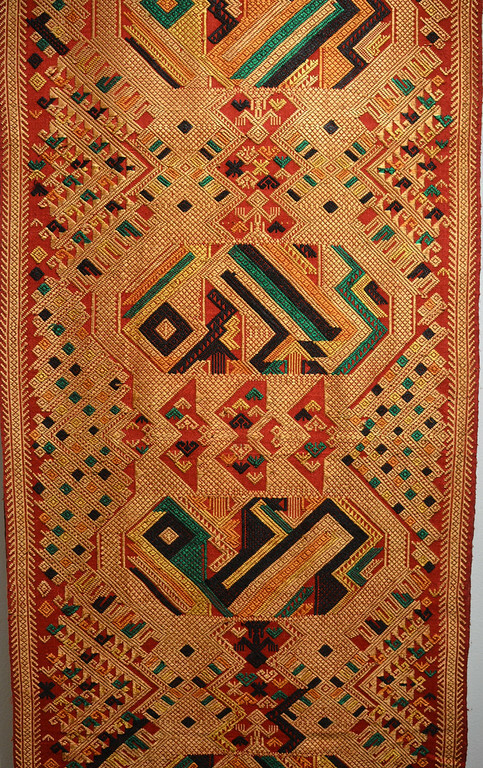 I don't know what they are called, since I know nothing about weaving, so if anyone knows, please share in the comments, OK? Here is a very short video of Bounxou in action. Bounxou and Ladda are in the process of writing a book! I am sooooo pre-ordering it. And they were nice enough to let me talk about them and share photos on my blog so that you could feel like you were there that afternoon, too. Every rare now-and-again, I am lucky enough to meet people like Bounxou and Ladda, whose incredible talent and art have a depth and richness that go beyond trends and vougeness and superficial cleverness. I am awed by their skill, charmed by their humility, floored by their generosity and inspired by who they are and what they do. What an interesting opportunity! 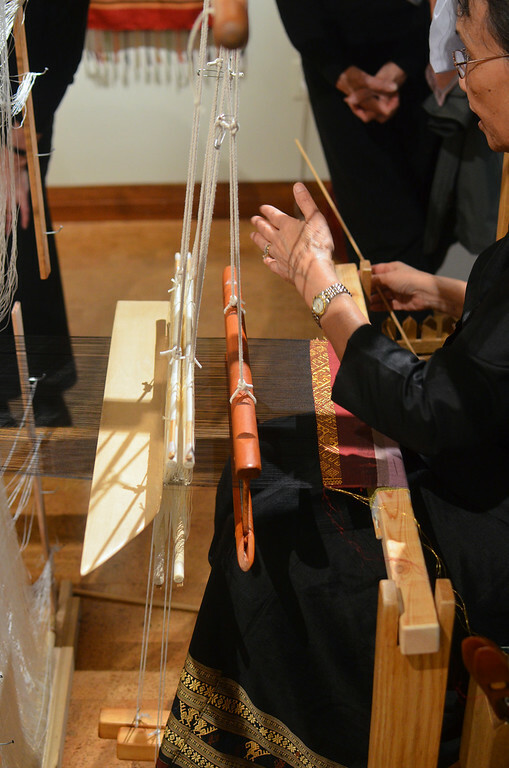 We once got to meet a weaver and try out the loom, but it was nothing as fancy as this! Thanks for sharing. Wow! Thanks so much for sharing with us. So happy for you that you got to experience all that! Thanks for sharing! All the work that goes into that is incredible! This was absolutely beautiful and amazing! How fortunate to have met these wonderful weavers who put their life and their culture into their work! Amazing! I had a chance to go to our local quilt and fiber festival... 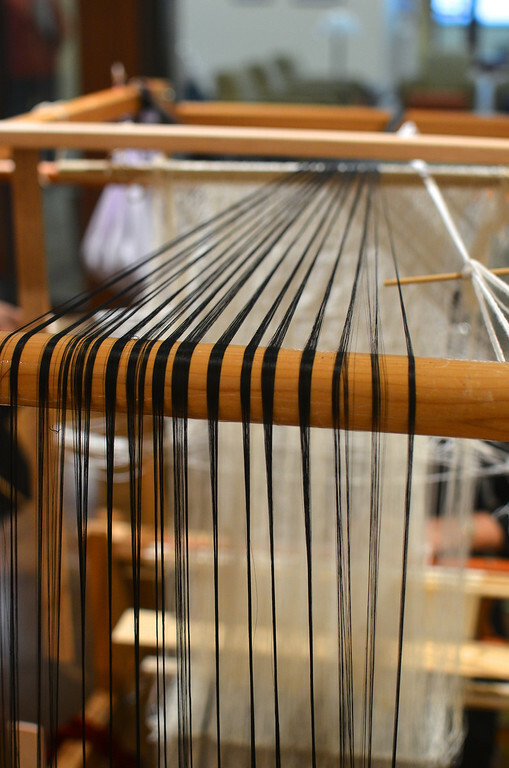 But the looms were all strung with cotton and merino. :) Thank you ever so much for sharing your photos of such beautiful workmanship and artistry. I too will be ordering their forth coming book for the photos alone! That is AMAZING! So wonderful that you were able to see that and meet them! This is amazing!!! 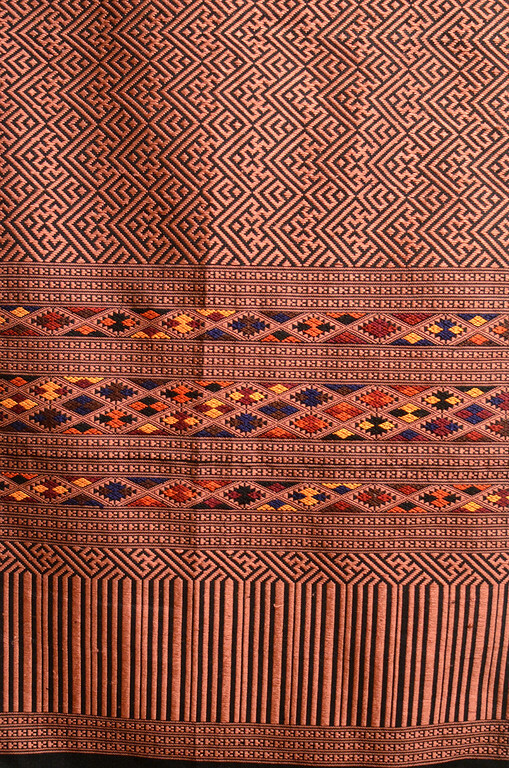 When we lived in Guatemala, my parents arrange for me to learn backstrap loom weaving from a local artist. I loved it, and still wish I could remember how to do it - I was only 8 when we left. Maybe someday I'll figure it out? Thanks for sharing this! 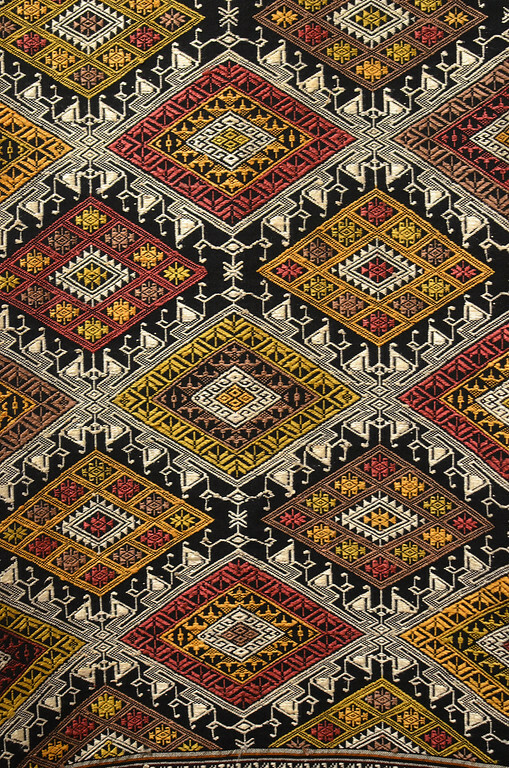 Have you seen this blog post about ikat? What an inspiring story! How wonderful when people can overcome so much adversity and get so much out of life (and give back as well)! Beautiful. This is a lovely story about a true cultural artist. 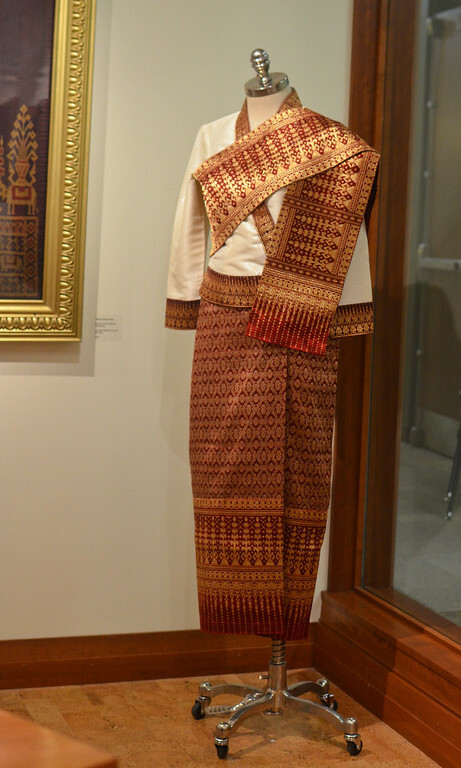 Lao weavers are known for their mastery of weaving, especially the brocade which is called supplementary or discontinuous supplementary weft. 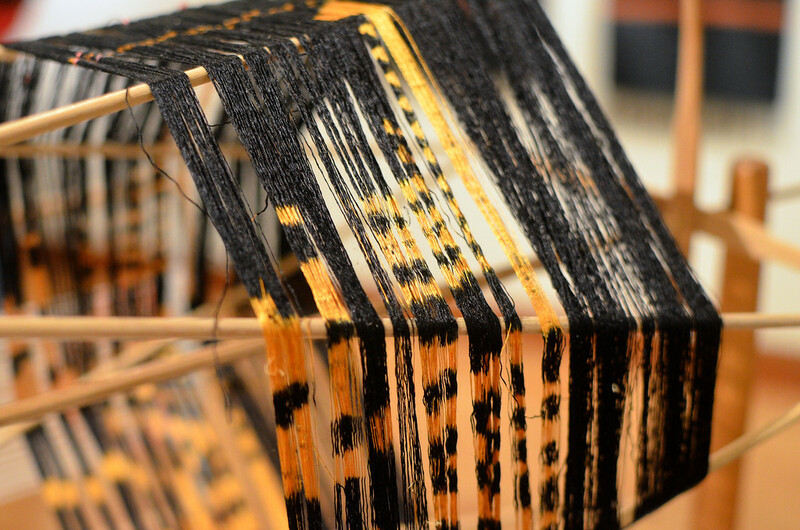 The white strings are tied ahead of time and they control the pattern; in the ikat technique, the pattern is controlled by the skillful tyeing and dyeing of the yarns -- the pattern emerges as the weaver weaves. 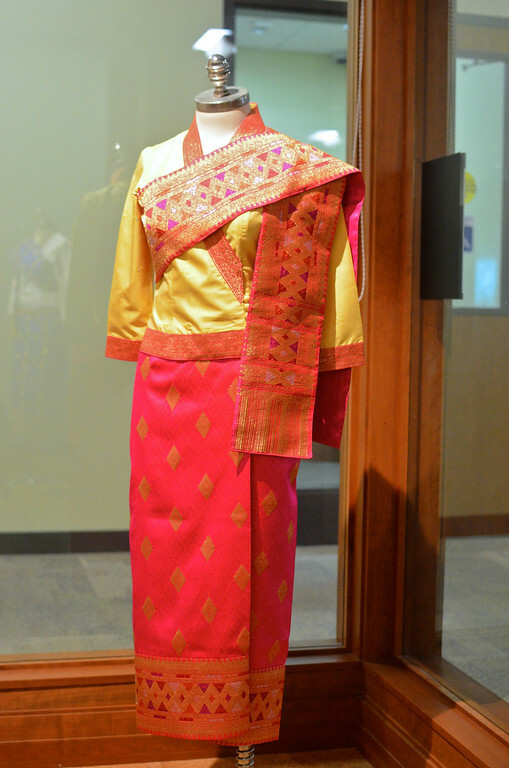 We work with Lao and Thai weavers through our Canadian-based social enterprise, TAMMACHAT Natural Textiles. 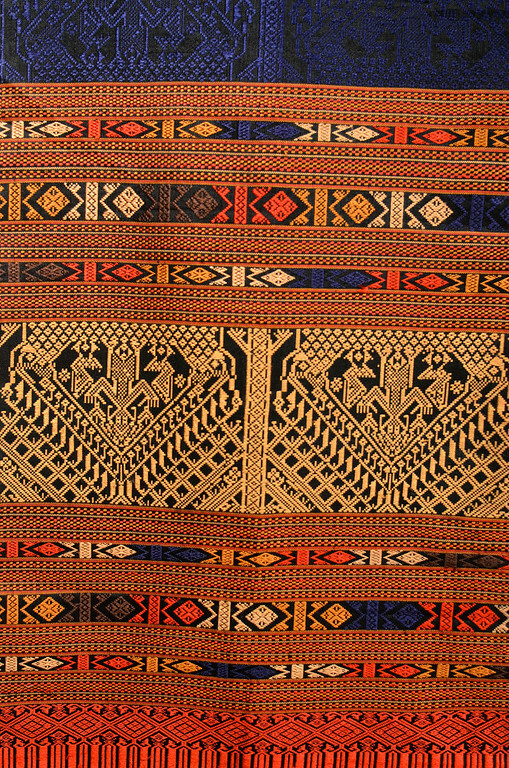 More stories about weavers still in Laos and Thailand on our website (www.tammachat) and blog (www.tammachatnaturaltextiles.blogspot.com). 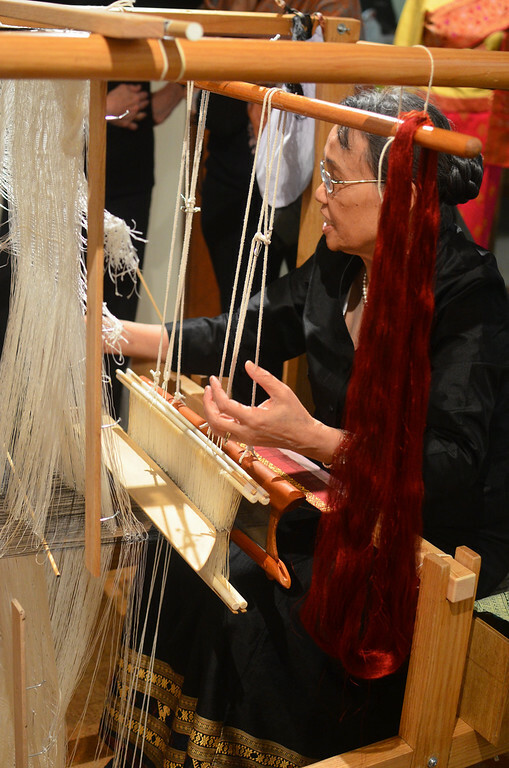 It's truly an honour to work with these weavers. And thank you so much for sharing the story of a true and inspiring master who is passing her skills and love to her daughter. This is why we have the internet! I would have never had the opportunity to see this story, see the beautiful creations or understand the weaving of brocade and Ikat. Thank you. 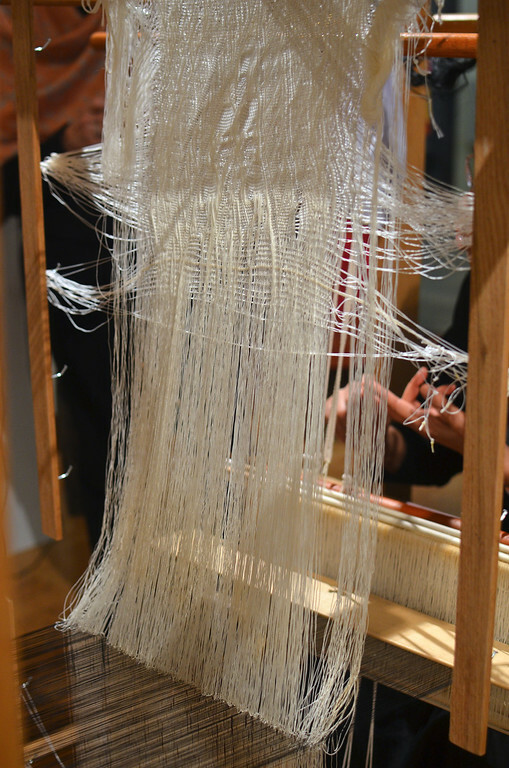 The weaving is very artistic! I've only heard about my grandmother and her silkworm farm from my mom. 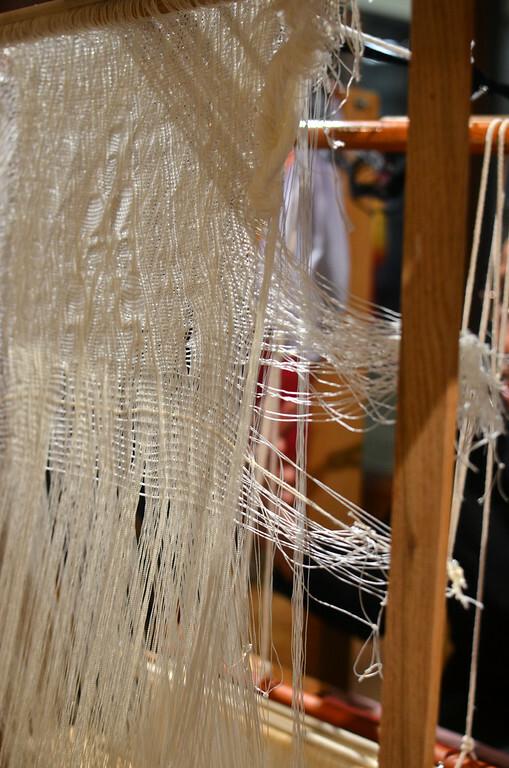 And also of the loom that weaved beautiful textiles. I would have love to seen this process in person. Thanks for sharing their story.